She’s a working mom and an environmental leader. 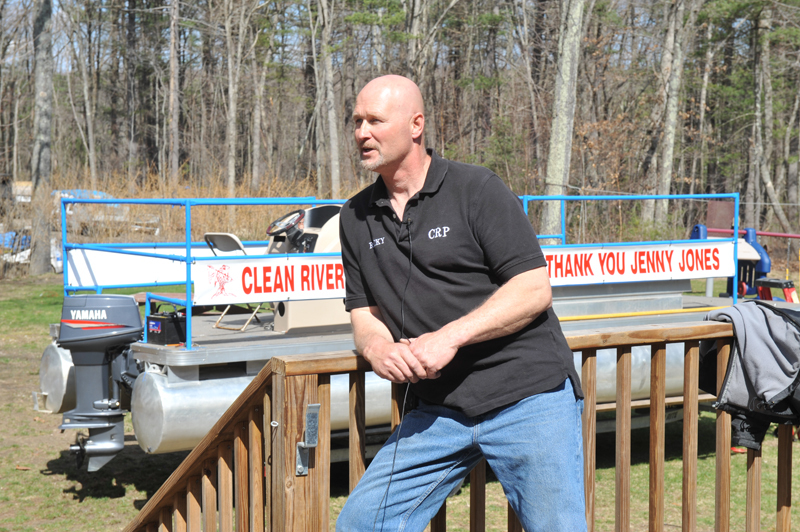 Paula Morrison, a registered nurse from Salem, New Hampshire, is the co-founder of the Clean River Project in Methuen, Massachusetts, whose goal is to clean up the Merrimack River which is 110 miles long. 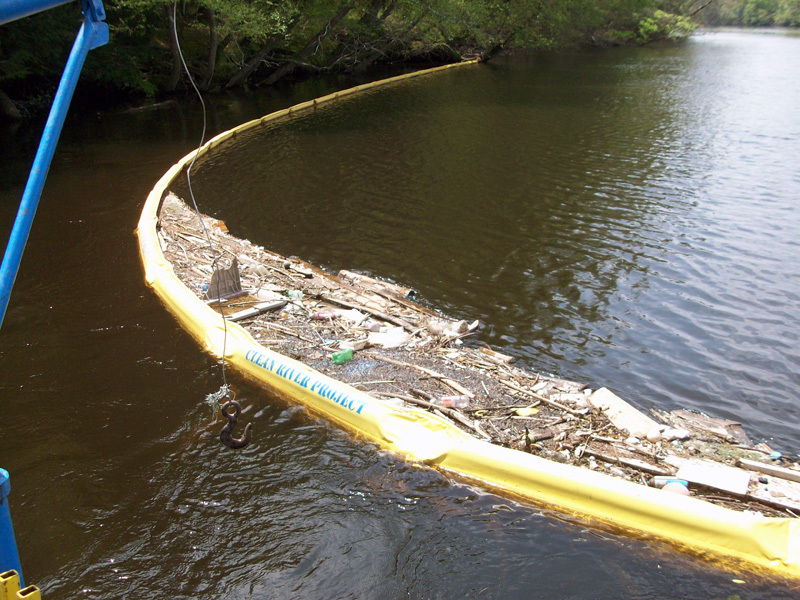 Paula requested $10,000 to purchase an aquatic debris boom that will catch the majority of trash, debris, and trees that now float down the river and pollute the shorelines. 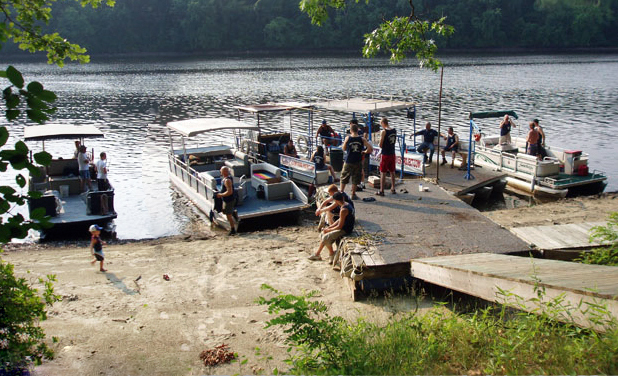 Paula’s gift will help beautify the river and provide cleaner drinking water to approximately 300,000 people. 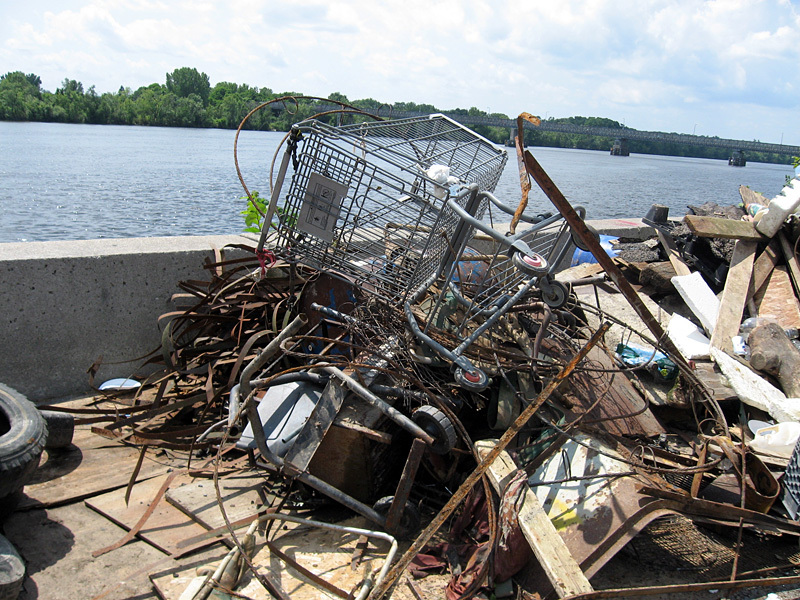 The Clean River Project is made up of all volunteers who have been cleaning the shorelines each summer, but then more trash just floats back down river and pollutes the areas that were cleaned. 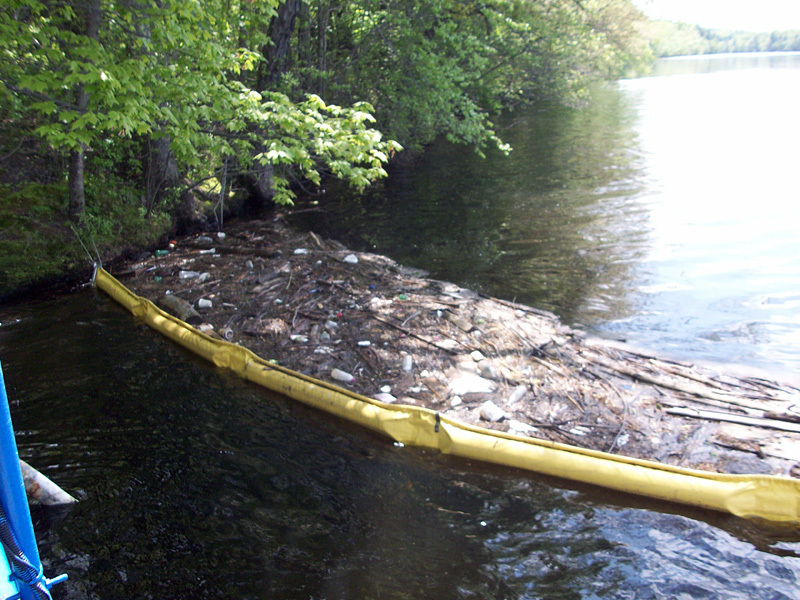 “If we could catch and contain the trash before it is littered everywhere then we could do a better job,” Paula wrote in her application, “and all communities in our area would have cleaner water and a beautiful natural resource to enjoy!” She plans to purchase 300 feet of an aquatic debris boom and the necessary anchors and weights to hold it in place. 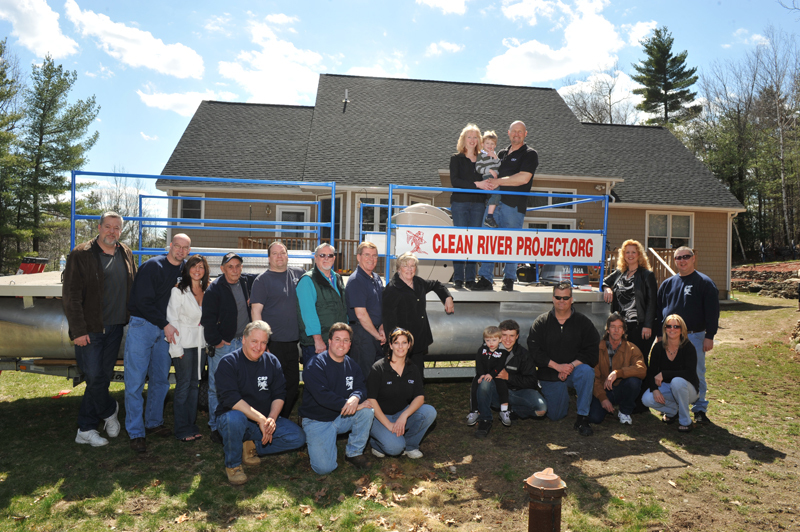 The boom will be installed in Lowell, Massachusetts with all the work being done by volunteers. 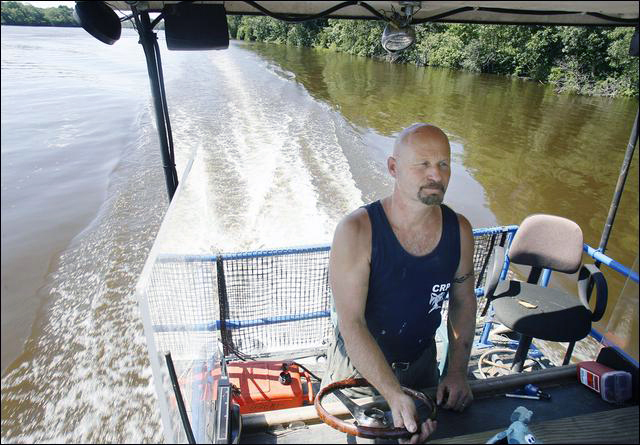 The river then travels through about 15 more communities that use it for their drinking water supply. 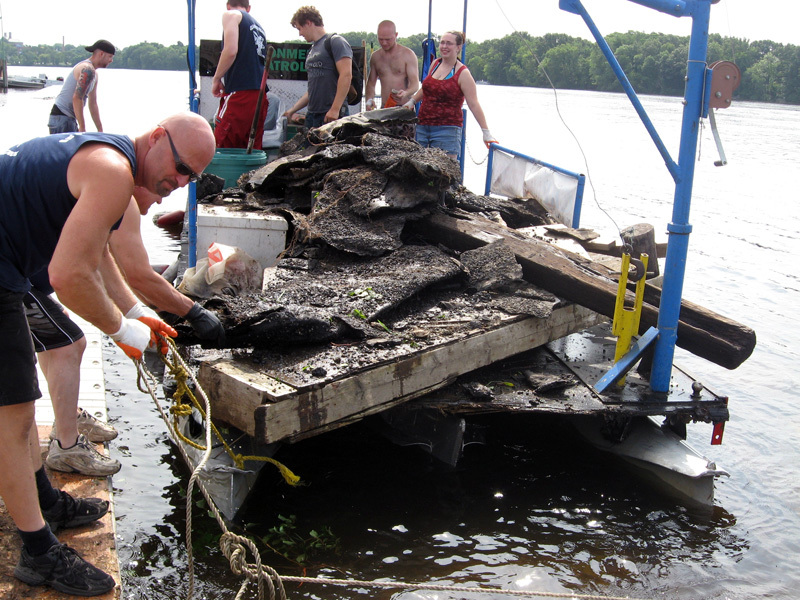 The last people to clean up the river were the Indians, according to Rocky. The team has already removed 23 cars with 18 more to go, as well as motorcycles, refrigerators, and more, soon to be removed by the volunteers, none of whom get paid. 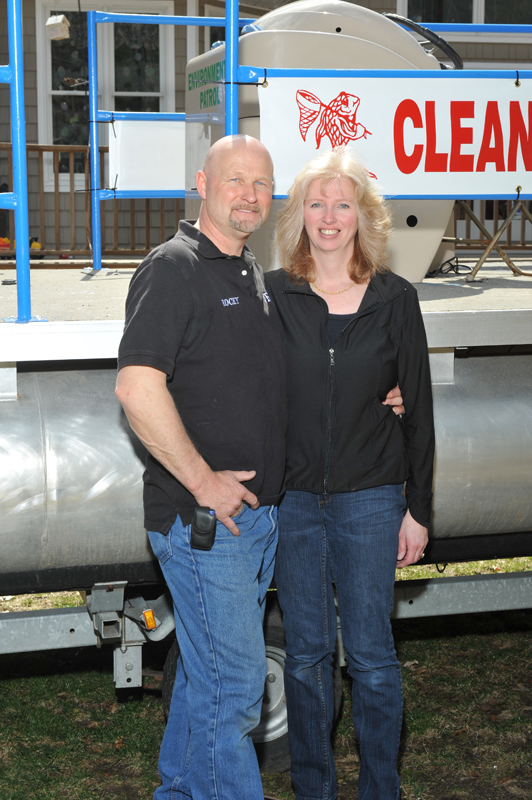 Paula’s partner and co-founder of the Clean River Project is her husband, Rocky. They have a 3-year-old son, Christopher and Rocky has a daughter, Shawna who's 17. "We almost had to cancel again because of another 2 days of heavy rain just before the Scavenger Hunt. 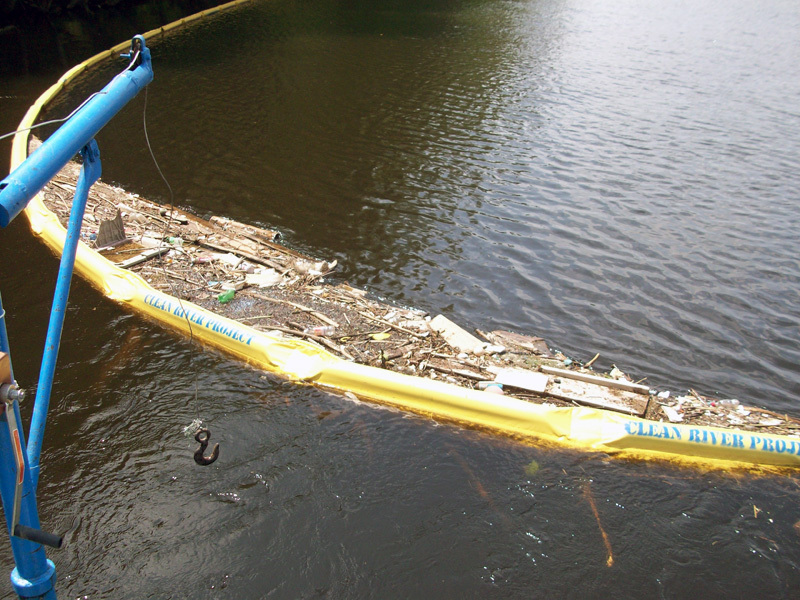 The bankings were under water and most of the trash was covered. Enel, the local Hydroelectric plant, did their best to help lower the river for us but couldn't keep up with all the water flowing from the north. Since there isn't a lot of summer left we decided to go ahead. We had a really nice sunny hot day for the event. 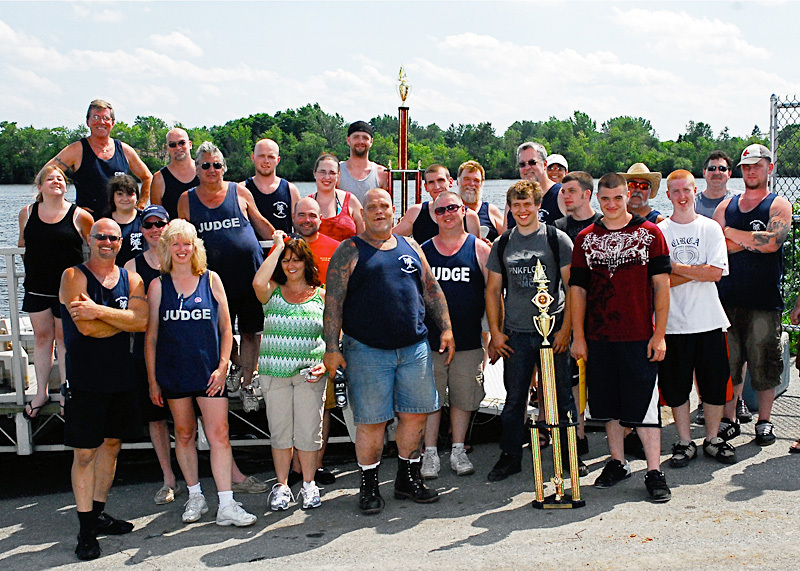 We did not have the turnout of boaters that we had hoped for but those who did participate more than made up for it. In all, there was about 35 volunteers. 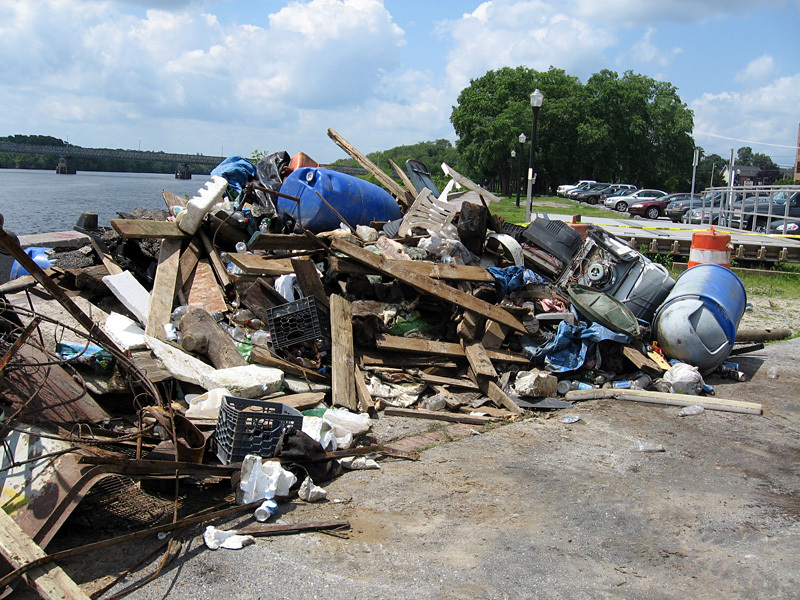 Even with the high water we pulled out a lot of trash. Two of the most unusual and talked about items were a "motorcycle" and an "entire roof" with asphalt shingles. 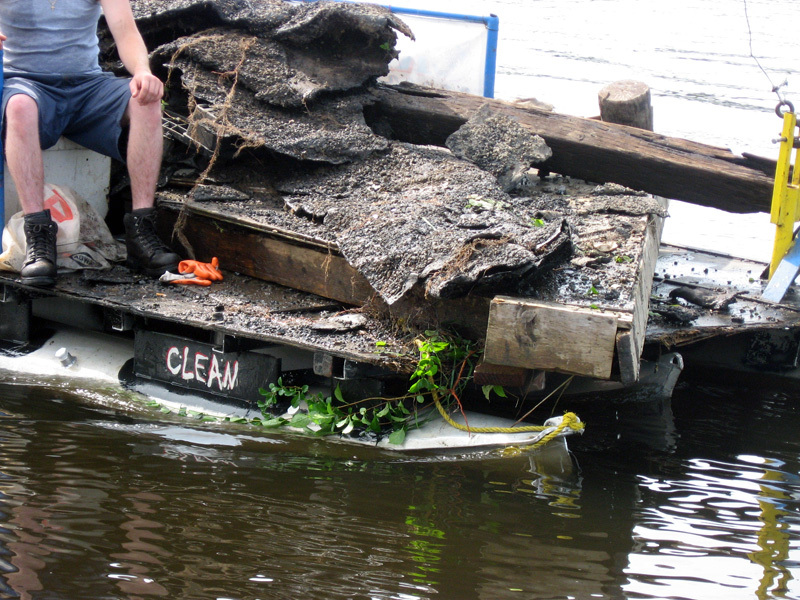 The roof was so heavy that the front of the boat carrying it was under water. 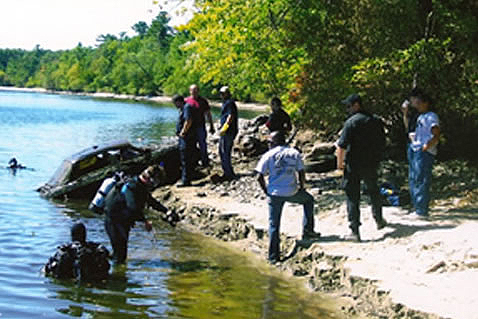 One boater dragged in a front end of a car and "2" car engines. In all, there was about 3 tons of misc. trash that included "4" Washing Machines," 2" Couches, "3" TV'S, "1" Shopping Cart, "3" Bikes, "15" Barrels, "2" Propane Tanks, "4" Gas Grills, and "46" Trash Bags of Cans and Bottles. Just to name a few! 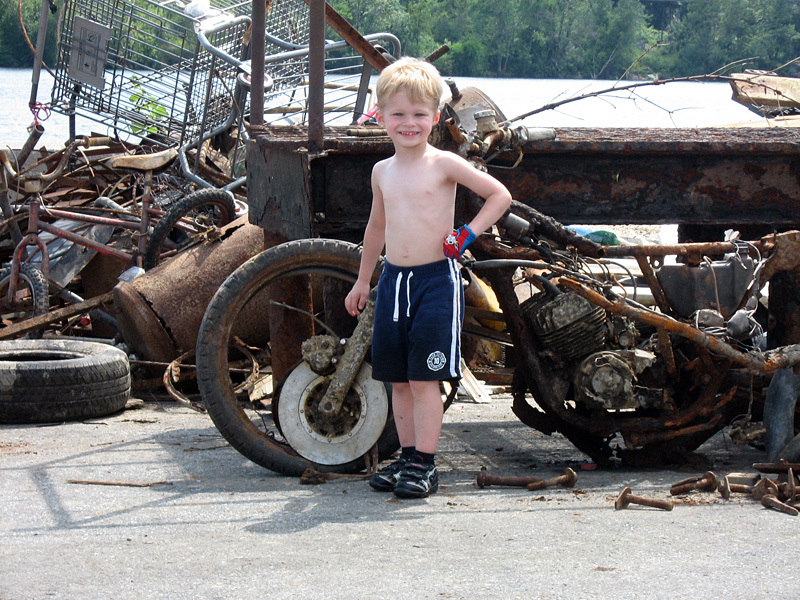 There was also "2" tons of Metal that included numerous car parts. 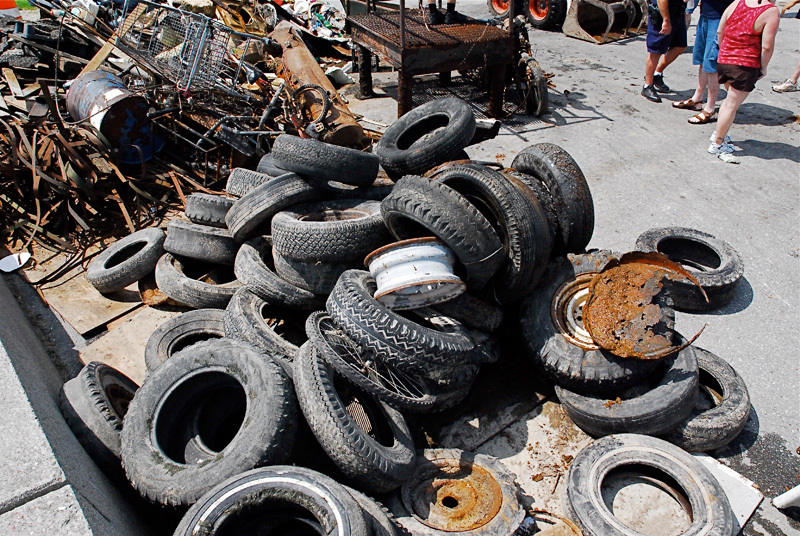 Of course, there is never a Clean-up when we do not have Tires. There was "54" to be exact. Our First Place winners who took home the $100 Gift Cert. to Olive Garden were three young men from Methuen, Mass. Tom Chaisson, Shaun Pollard, and Ryan Landrey. 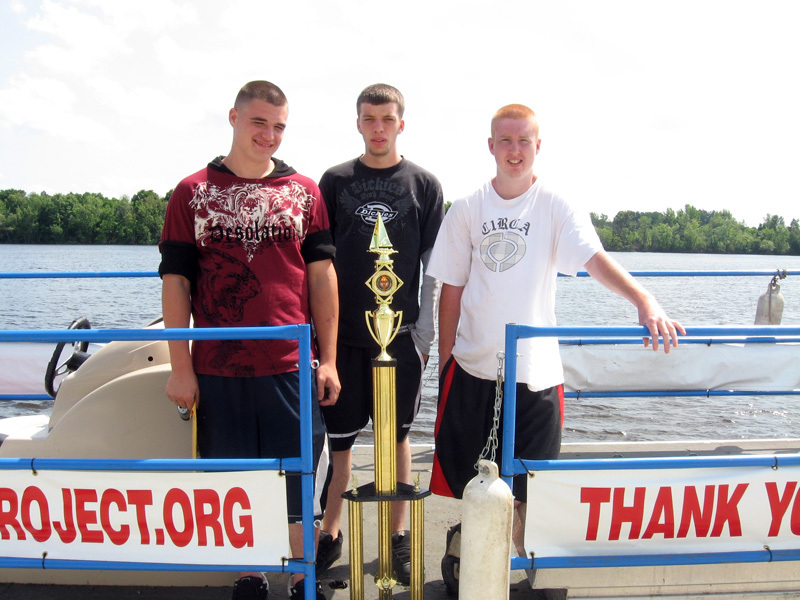 With a small 12 foot boat they brought in over 800 points. Everyone did a great job! 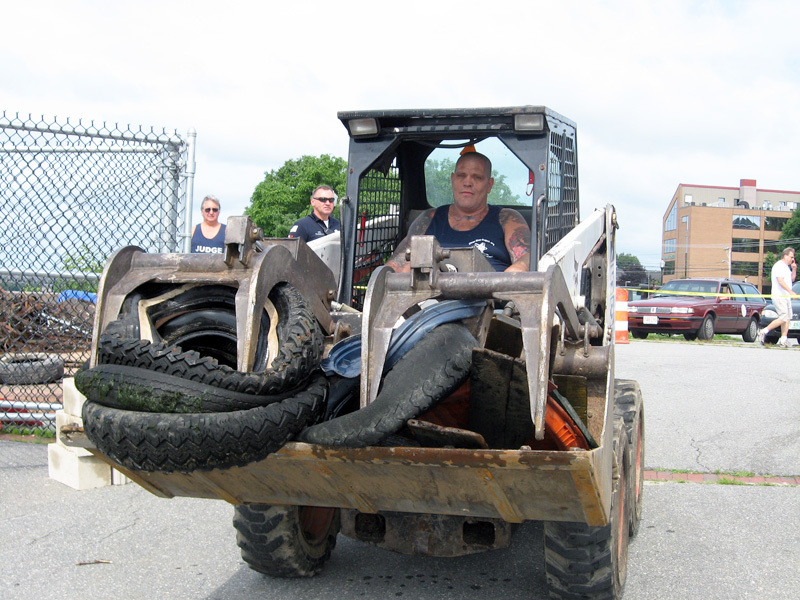 Our next project will be a Tire Pull Day sometime in September." "We have been so busy that I did not get a chance to update you. 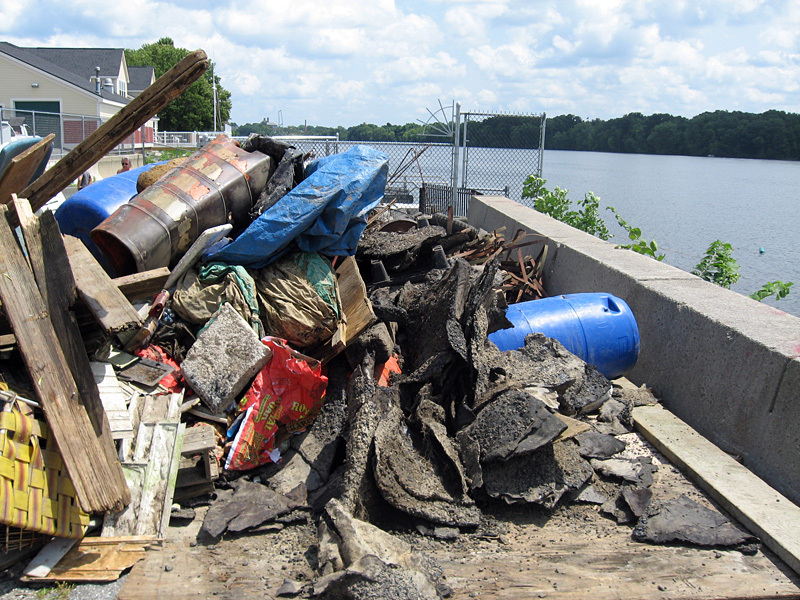 Because of all the heavy rain we've had the Merrimack River water level has been close to flood level and the river current to dangerous for the Big Cleanup. 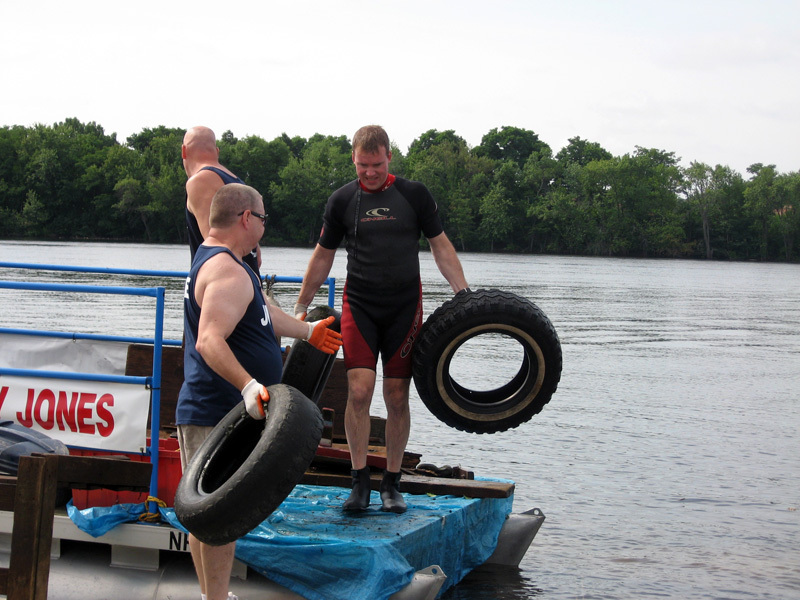 We changed the date to July 11th but then we had more rain making the river unsafe for us to clean and had to cancel. So now we are on for next weekend July 25th and praying that Mother Nature gives us a break. So far it's looking good. My father-in law had even flown in from Florida to help on June 25th so it was a real disappointment when we had to make the decision to postpone. I will send pics and an update after the event. into the river and they hope to get the rest in after Memorial Day. "They are working really great," said Paula. 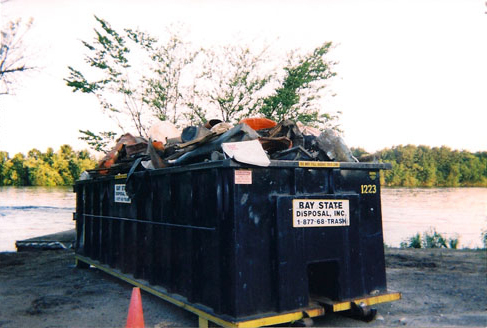 "The booms are trapping lots of items such as tires, wood, barrels, and a lot of small things like Styrofoam cups. Bottles, too. 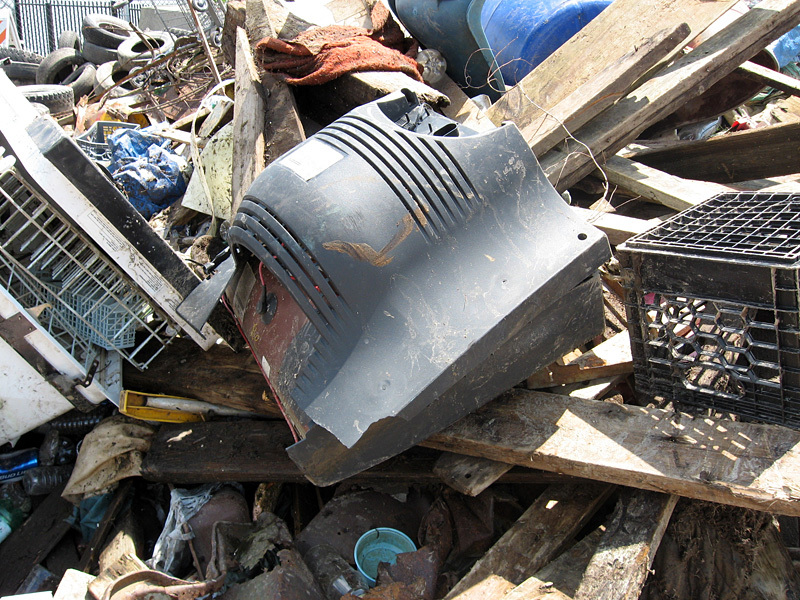 We sort through it all and recycle most of it. My husband has to clean the booms out twice a week. 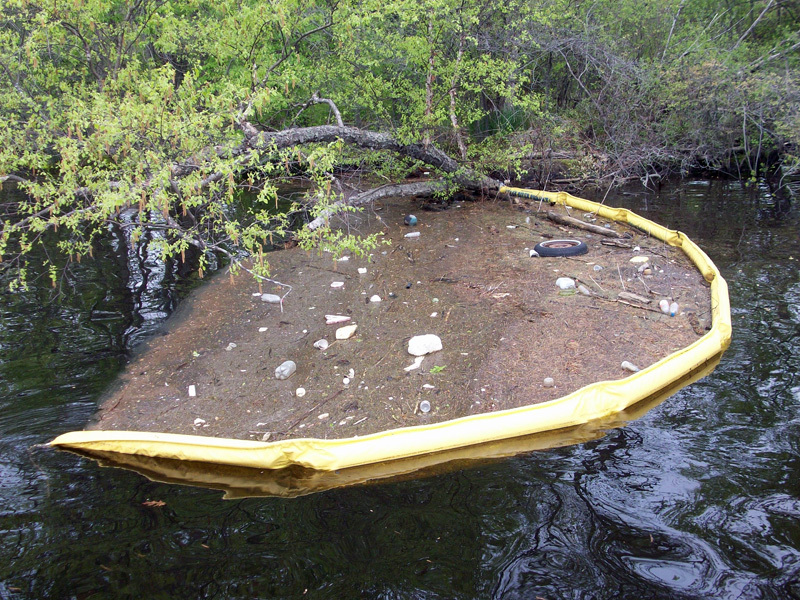 Unfortunately, there has been a lot of medical waste floating into the booms which concerns us! Not only is this dangerous for the volunteers but why and who is disposing hazardous material into our drinking water?" That's a good question, Paula. Let's hope that seeing the river being cleaned up sends a message to those who abuse the environment that it's time to stop. The booms have arrived! 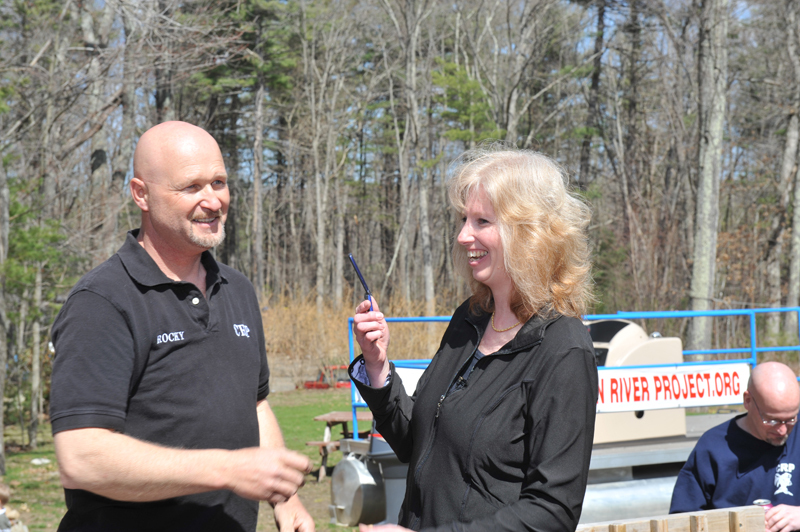 Paula said everyone is very excited and Rocky will start making plans to install them into the Merrimack River. He also completed the SS Jenny Jones and took it on its first voyage. It won't be long before the booms are installed and doing their job... just in time for summer. 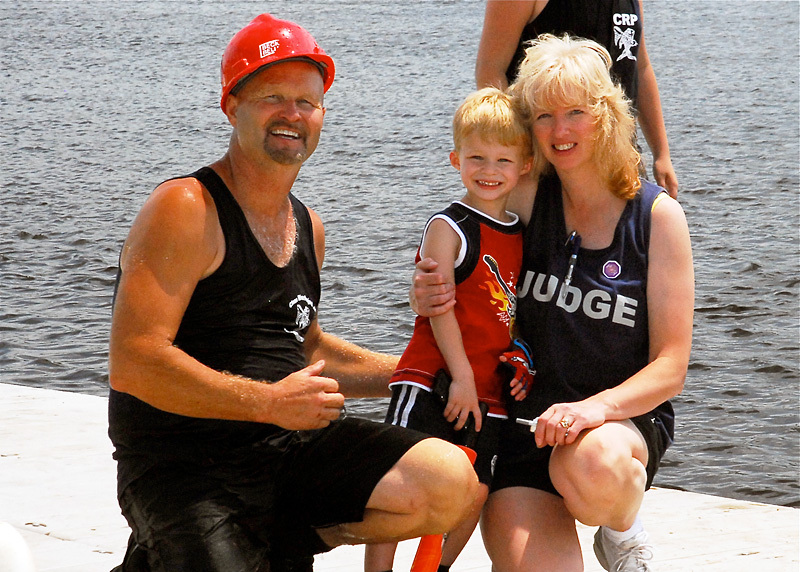 Paula and Rocky have already ordered the debris boom and it's expected to arrive in less than two weeks. And the fancy pictures on the left were taken by Rocky's sister, Bobbie. Thanks, Bobbie. Rocky was an awesome ally today for my surprise phone call to Paula. He sent her a bogus email from the "Massachusetts Department of Environmental Protection" saying she would be receiving an award from them so she was not suspicious when people started gathering at their home, including the press and photographers.He invited the entire CRP team as well as friends and family, her nieces and brother, Cal so there were about 25 people out on their deck. Before the call ended, Rocky told me that his wife was already a hero by saving lives on her job at a local hospital. 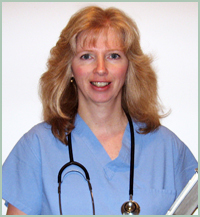 She works the 7 p.m. to 7 a.m. shift in critical care. He also said people don't realize how much good this debris boom will do. The river begins in Franklin, New Hampshire and flows out of what is called "The Lakes Region" of New Hampshire. It then flows South into Massachusetts until it ends its journey in the Atlantic Ocean in Newburyport, Massachusetts. 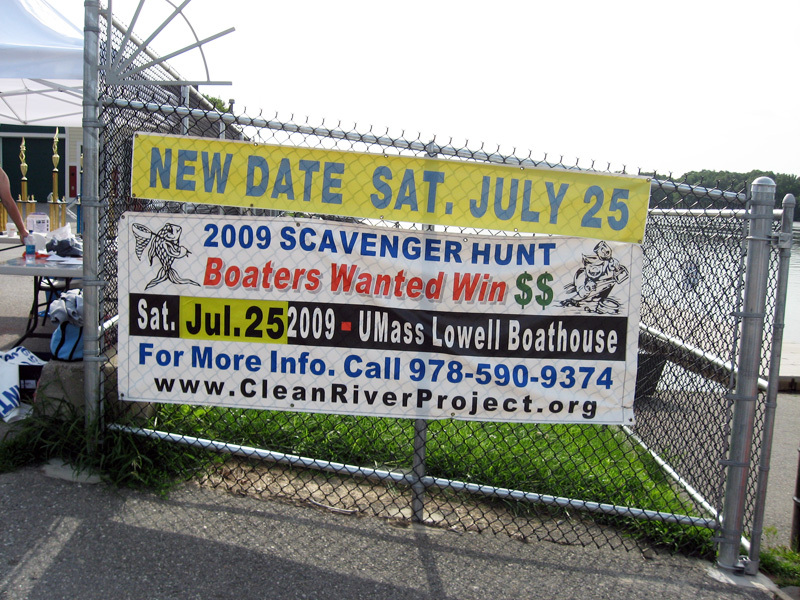 The group is planning a massive cleanup on June 27th in Lowell. 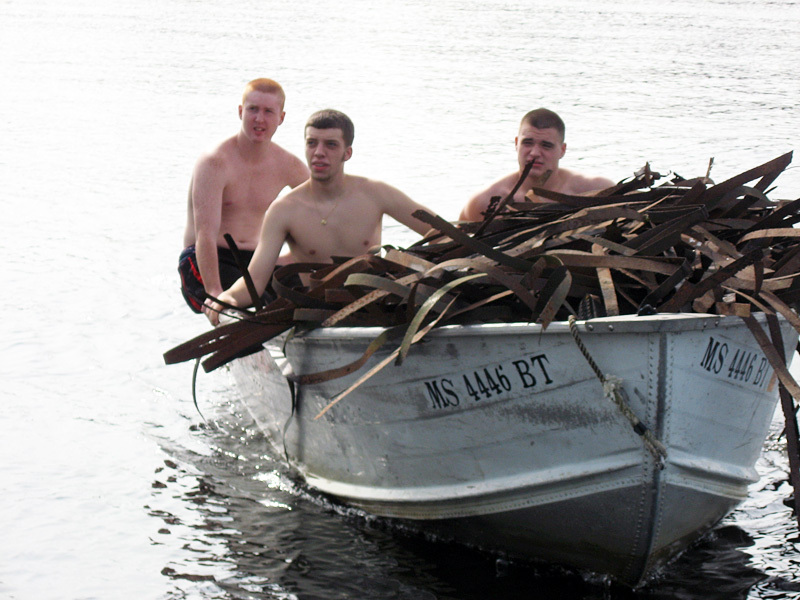 And here is the moment that touched me the most: Rocky said they take old boats and use the parts to build barges and the new one will now be called the SS Jenny Jones. It's an honor that will make me very proud. And it's an honor to be able to help this tremendous group of volunteers. Thank you, Rocky. 04/09/09: Jenny wrote... "Paula, I have much respect for the work you and the volunteers are doing. What a wonderful gift you are giving to these communities." 04/09/09: Damon wrote... "Paula, let’s hope that more people follow your lead to reduce pollution and beautify our rivers. Congratulations on your good work!" 04/11/09: Bobbie Koralishn wrote... "Rocky and Paula, you are two dedicated people who are doing an extraordinary operation for the ecology. 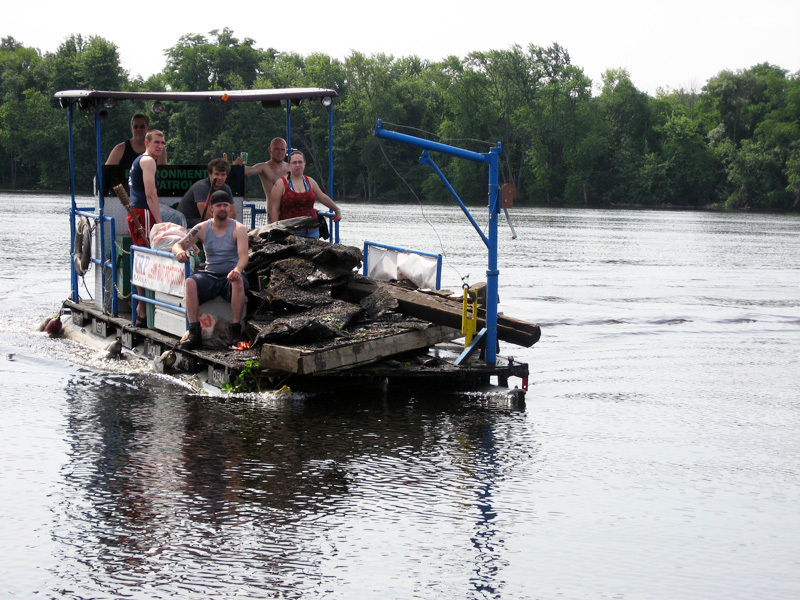 (My brother Rocky and I are from a family of 12 children that grew up on the river banks.) Rocky, I know this project is your deepest desire and I hope you both achieve all you set out to do. Good Luck!" 04/12/09: Matt wrote... "Congratulations to my Aunt Paula for her dedication and hard work involving the clean river project. The Merrimack river was Named by the Penacook band of the Eastern Abenaki Indians that lived along its banks up into the mid 1700s after being displaced by the events of the revolutionary war in combination with being pushed off their land by New settlers that took away the Indians land for farming. 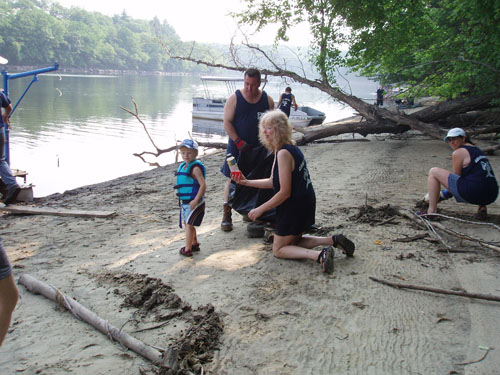 Before the damage from 300 years of farming, industrial and urban development and the resulting pollution, the Merrimack river was a beautiful watershed with pure water and healthy populations of fish and wildlife. 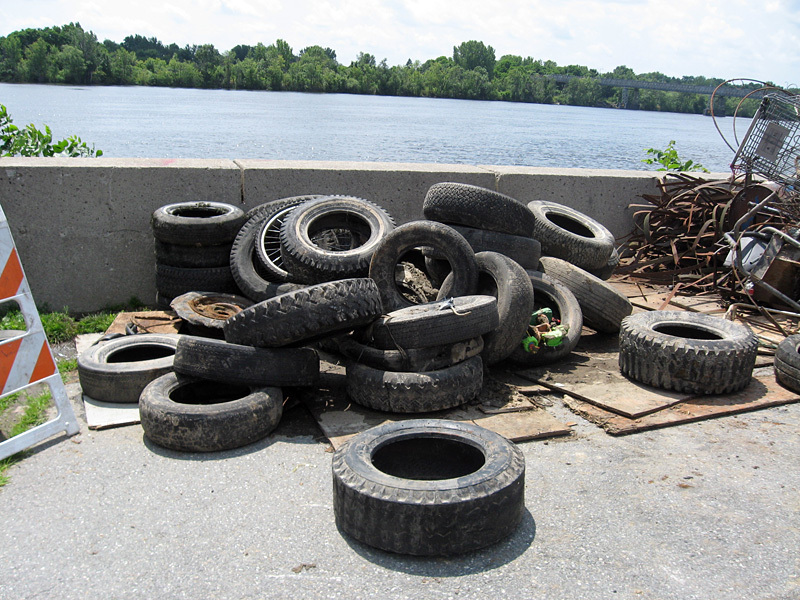 The last 300 years of disrespect such as dumping cars, trash, plastic and tires in the river has taken its toll and it is about time people showed some respect for the land and restore the river to its natural purity and beauty. Thank you Aunty Paula from your nephew, Matt"
"Congratulations Paula and what a job well done! 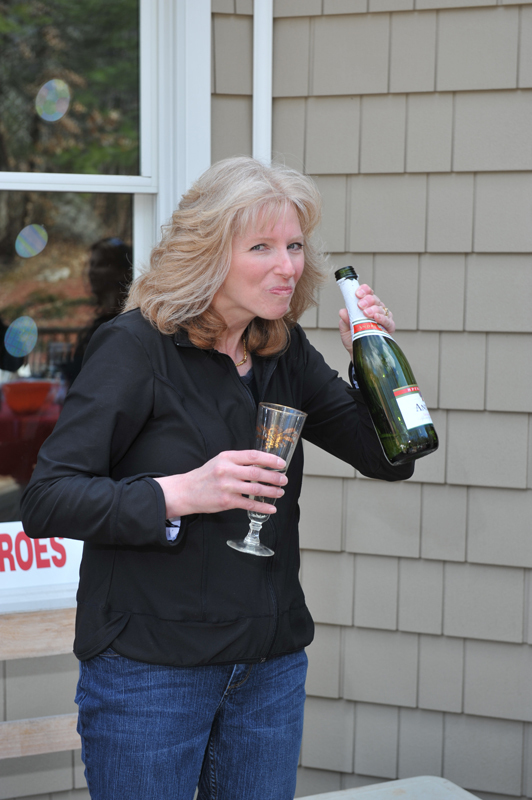 What you are doing is inspiring and hopefully will trickle downward to many other communities! Good for you Rocky as well. Keep up the great work that you all do!" 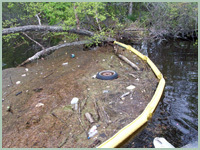 04/14/09: Terri O. wrote... "Hi Paula, first, it's unbelievable how people pollute our waters. The only way we can start cleaning the planet is one lake and river at a time. 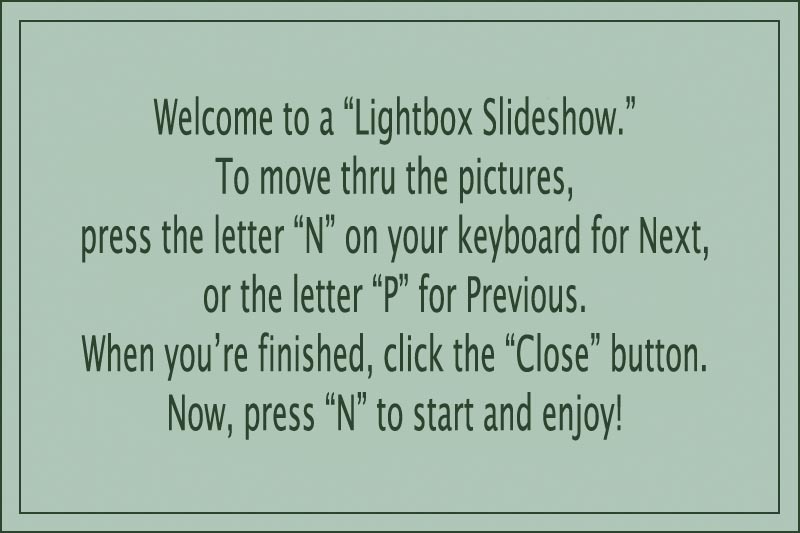 Thanks to you, we've begun! Let's hope this consciousness will spread." 04/15/09: Carol H. wrote... "Paula, Congratulations! 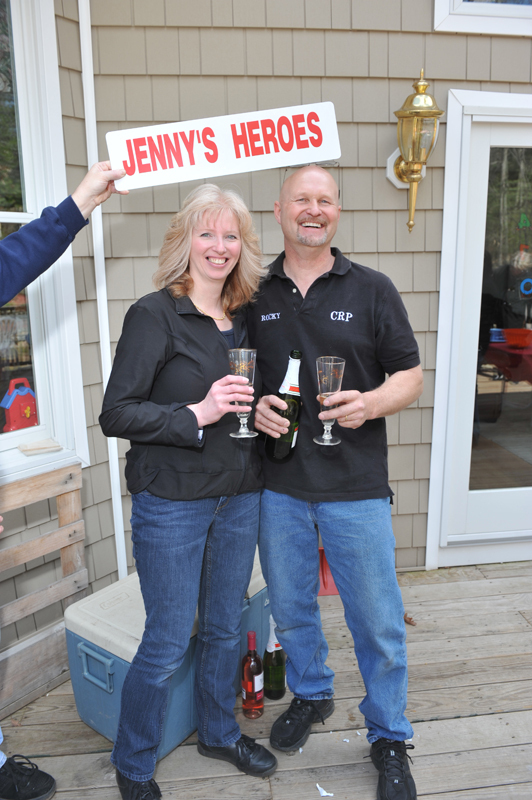 I cannot think of a more deserving person to be a "Jenny's Hero". I know how hard you worked to get this all started. I applaud you in so many ways. Not only for caring enough about our natural resources to make them beautiful again. 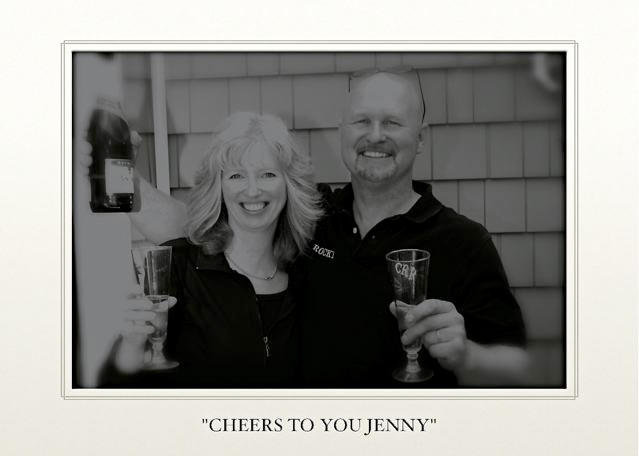 For teaching us how important it is to have a strong commitment to our family and community. Showing our children that its up to us to care about where we live and that they too can make a difference ! Thank-you!"